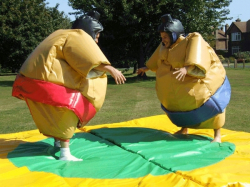 Everyone’s favorite — the Sumo Suits will have everyone standing in line to try it out. This set includes two padded over-sized sumo wrestler suits, safety headgear, large padded mat for everyone's safety. This is sure to bring a laugh to all!